Migrants at Calais will be fast-tracked into Britain under new plans agreed by Theresa May as she bowed to further pressure from the French. Adult migrants seeking to come to the UK via Calais will have their applications processed within one month, rather than have to wait for six months. Children will see their waiting time slashed from six months to just 25 days, it was announced yesterday. French President Emmanuel Macron outlined the deal at a joint press conference with Mrs May after an Anglo-Franco summit at Royal Military Academy Sandhurst. 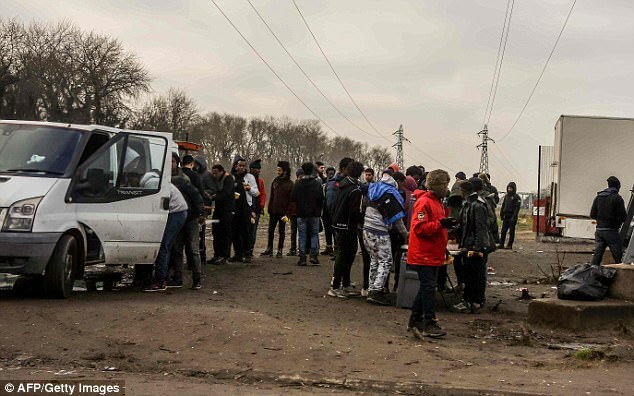 Mr Macron said they had agreed upon a ‘Sandhurst Treaty’, shaking-up the process for dealing with asylum seekers and migrants camped at Channel ports. He said this was the first joint treaty to be signed on such issues in fifteen years. Mr Macron said the UK and France are ‘making a new tapestry together’, as he confirmed plans to loan the Bayeux Tapestry to the UK. Mr Macron said the issue of migrants at Calais was a ‘common challenge’. It had already emerged that the UK would pump another £44.5million into beefing up border security at Channel ports, with cash funding extra fencing, CCTV and detection technology. The plan was met with fury by politicians who said enough had already been paid to the French to tackle the problem in their country. 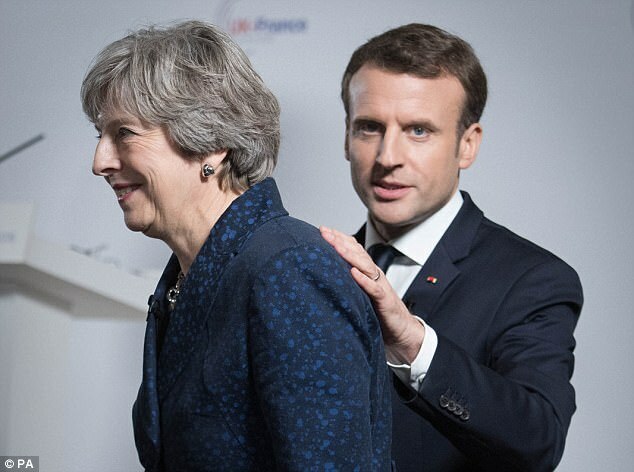 She stressed that the deal with the French would ‘enhance the security of our border’ and would in turn reduce the number of migrants coming to the UK. A Downing Street source insisted the plans would reduce the ‘pull factor’ and by speeding up the process, cases would be thrown out quicker. This would mean there would be less migrants waiting in Calais to see if they can come to the UK and less of a problem at the border. 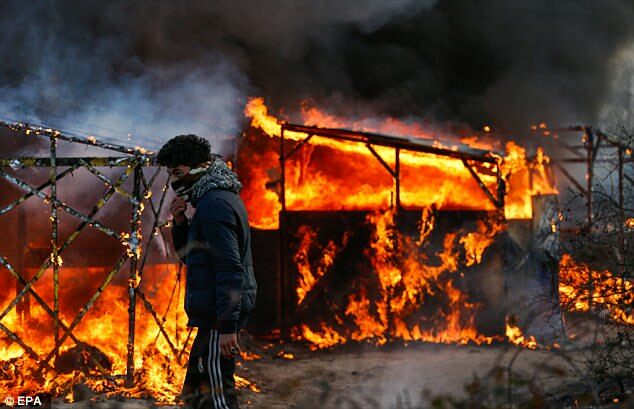 Mr Macron said the current situation in Calais was ‘not satisfactory’. ‘The treaties signed today, for me, provide for the framework in which we shall be able in the coming months to bring about a concrete answer so that we no longer have migrants living in Calais, as we were seeing in the spring of 2016,’ said the President. He said the new treaty would allow him to fulfil his 2016 vow that after Brexit ‘migrants will no longer be in Calais’. The French president, making his first visit to Britain since entering the Elysee Palace, was greeted at the Royal Military Academy, Sandhurst, with a guard of honour from the Coldstream Guards. The leaders do not want to see a return of the notorious Jungle Camp, which attracted thousands of migrants from across parts of Africa and Asia. 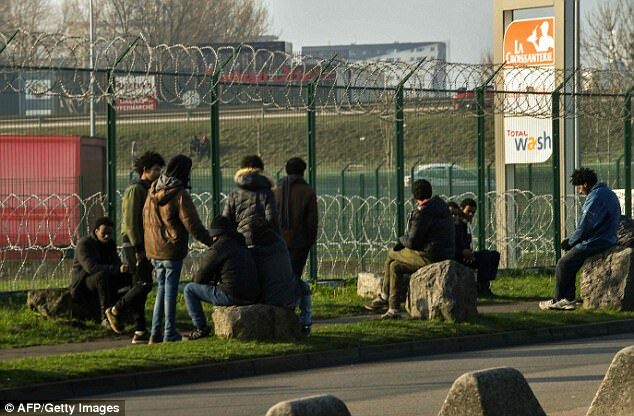 France also wants Britain to take in more migrants from Calais, especially unaccompanied children. Mrs May pointedly declined to give a number of migrants that Britain would take when asked at a joint press conference. Instead she stressed the need to clamp down on people smugglers and take other measures to stop migrants from getting to Calais. Mr Macron said the treaty would mean ‘smarter and more efficient management of the border’ and a more efficient, humane processing system for migrants.